C. didactylus is uniformly brown. C. hoffmanni is lighter in color; pale throat, darker chest. Gray-brown/tan hair during dry season. Tinted green in the wet season due to algal growth. Total populations not reported; see IUCN fact sheets for densities. Slow, deliberate movement. Agile in trees; move by hooking claws onto branches. Can move on the ground, but can only drag themselves with claws and forelimbs for short distances. Excellent swimmers. Nocturnal; activity begins about one hour following sunset and ceases about two hours before dawn. Adults typically solitary, unless with mates or young. Females may feed in same tree. Mainly plants—leaves, twigs, buds, fruit. Occassionally small mammals (rodents) and insects. In prehistoric times, sloths were found in the Americas (South, Central, and North Americas), the Caribbean, and Antarctica. 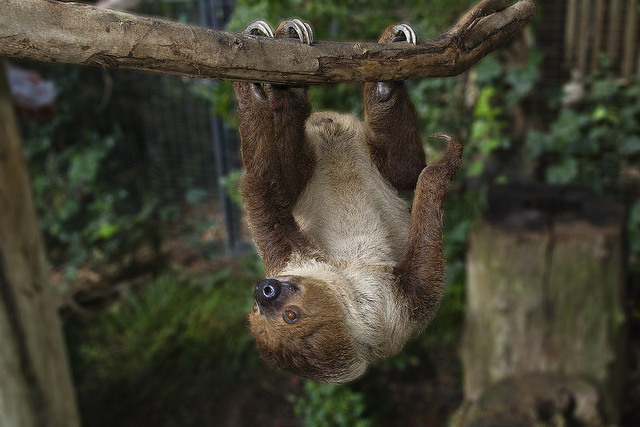 Two-toed sloths do everything hanging upside down—eating, sleeping, mating and even giving birth! © 2009-2019 San Diego Zoo Global. Minor updates 2017, 2019.